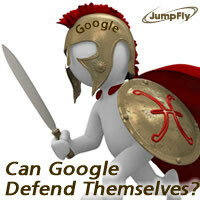 Can Google Defend Its Lead? Google has been the dominant search engine in the US for many years, but is the mighty giant in danger of losing its leadership status? Though it may sound far-fetched today, technology develops rapidly and Google has been losing market share over the past 6 months. The latest data from Experian Hitwise indicates that Google supplied 64% of searches in the U.S. in March, 2011 while Bing-powered search, which includes both Yahoo and Bing.com, accounted for 30% of U.S. searches. Just 6 months ago, Experian Hitwise reported that Google controlled 72% of the U.S. search market while Bing powered search accounted for 23%. In the past six months, Bing’s market share in the U.S. increased fairly significantly to 30%. Additionally, Hitwise reported that Bing and Yahoo achieved the highest success rates during the month, meaning that for both search engines, more than 80% of searches executed resulted in a visit to a website while Google’s rate was about 66%. I am not suggesting that Bing powered searches will overtake Google anytime soon, or ever, but it does appear to be evolving as a potentially serious threat to Google’s search empire. Perhaps Google has taken its eye off the ball by getting distracted with so many other initiatives? For example, just last week Google invested $168 million into BrightSource Solar Project. This sounds like a great cause, which I applaud, but does co-founder and new-CEO again Larry Page have the experience, time & knowledge to guide a company that has branched out into so many things? There has to be consequences. Perhaps Google search is getting somewhat neglected, which would not be a wise move since just about all of Google’s revenue is generated by their search ads. In Google’s defense, they have been launching many new search related initiatives and they have greatly improved Google search and the Google AdWords advertising platform. The AdWords platform has evolved quite a bit over the past year and now provides a suite of valuable new tools for advertisers. Additionally, Bing recently launched an $80 million ad campaign that seems to be working. Google faces threats from multiple fronts as social media continues to emerge as a popular and potentially valuable platform for advertising. According to Nielsen Web Traffic, Facebook has about 135 million U.S. users compared to 152 million that use Google. However Facebook’s users stay on Facebook 3 times longer than users stay on Google. What happens when Facebook develops their own search that integrates all of their valuable social info? Hmmm??? Google is certainly aware of the threat and has even tried to combat it with social media efforts of its own, but so far with little success. Google’s recent launch of the +1 feature is an example of a social media initiative. As Google gets increasingly larger, can they remain nimble enough to successfully evolve with the rapidly changing search environment? Only time will tell. Google Docs isn’t a new feature, but it’s one that I’m using more and more. 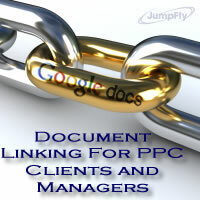 I’ve used it with clients to collaborate on ideas, or to send keywords or ad text. But lately I’ve been using it with my PPC clients to stay current with stock levels. They can update the file when something goes out of stock or comes back into stock and I can make the corresponding changes to their accounts. * I can protect it so only the people I invite to access the document can see it. And I can also make it read only. * It’s real-time. I can actual see changes being made if I’m in the document at the same time someone is changing something. No syncing necessary! No emailing. No updating the file to make sure you have the most current information. * It automatically saves. I love the fact that I don’t lose my changes. Google Docs is making my job faster and easier, saves my clients money because they are not advertising on something that’s out of stock, gets them more business by making sure I’m advertising something they want to sell, and doesn’t cost me or JumpFly a cent. Apple to Buy Yahoo? iYahoo to Emerge? Allegedly, Apple is in the works to replace Google as the default search engine on its iPhone with Microsoft’s Bing. If this proves true, it is further evidence of the intensifying power struggle between Google and Apple. Bloomberg reports that,”the talks have been under way for weeks, said the people, who asked not to be identified because the details aren’t public. The negotiations may not be concluded quickly and might still fall apart, the people said.” Currently, Google is the default setting on Apple’s iPhone. If users want to search using Bing, they have to download an application and install it. Nielsen’s latest data indicates that of those who use mobile search, 86% used Google compared to 11% for Bing. However, with iPhone’s dominance and potential switch to Bing, this soon may change. Apple could certainly breathe some new life into Bing, or someone. Dare I suggest that Apple instead partner with or buy Yahoo? There had been speculation about this potential reality about a year back, prior to Yahoo negotiating a unique partnership with Microsoft. 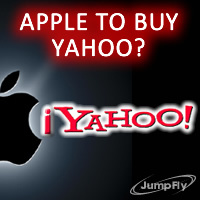 However, that deal does not necessarily prevent Apple from swooping in and taking over Yahoo. Apple could take Yahoo mobile and turn it into the mobile leader. Yahoo also offers an array of additional potential value to Apple. Now seems to be an ideal opportunity for Apple to make a move. While Google is distracted in China and losing their search focus, they may be providing Apple a window of opportunity to get into search. Apple could then put Yahoo, or iYahoo, in position to potentially dominate the mobile market, which could carry back over to the wired world. This clash of the titans is likely to yield some interesting results. Change is in the air as Apple and Google determine the technological fate of mankind. As the mobile market evolves, will Google and Apple co-share the entire future mega-mobile market? Will one emerge as the clear leader or will new technologies emerge to topple these seemingly invincible goliaths? Many a great company once dominated an industry, only to become complacent and fall to its doom. Google and Apple are anything but complacent, but the pace of change is rampant in the rapidly evolving online and mobile marketplaces. According to data gathered by HitWise, the leading global online intelligence service, searches of one word comprise 24.13% of all search queries. People are lazy searchers! This may be valuable information to consider for PPC Advertising. Google is testing personalized search results by adding information from users’ “public social graph” and integrating it into the individual’s search results pages. Google is using everything they know from users’ profiles, social networks and more to provide a customized search experience. Along with real-time search, these developments certainly change the search engine optimization (SEO) landscape. That’s all for now. Stay tuned.